Over the last year, some of Apple's key component suppliers have begun increasing their U.S.-based production, which could be a sign that more of the iPhone is already made in America than one might think. When Apple Chief Executive Tim Cook was recently asked at the D10 conference about the possibility of his company building products in America, he noted that some crucial parts for the iPhone and iPad are already manufactured stateside. Specifically, he identified the ARM processors built by Samsung in Austin, Texas, or the Corning Gorilla Glass made in Kentucky. But the iPhone and iPad  Apple's two most popular products  are made up of much more than the CPU and glass that Cook highlighted. These complex mobile machines include power controllers, proximity sensors, cellular radios, Wi-Fi chips, audio and video chips, accelerometers and more  and a number of those parts come from American companies. Of course, there's no guarantee that any of the parts found in Apple's products are, with absolute certainty, made in America, even if they're sold by a U.S. company. Many chipmakers build their products at a number factories located around the world. And ever-secretive Apple doesn't even disclose who makes many of the parts found in its products, leaving enthusiasts to tear the company's devices apart and hunt for clues, sometimes to no avail. But over the last year, some of the more prominent chipmakers that Apple does business with, including Texas Instruments and Avago Technologies, have begun to increase their stateside production of components. One industry contact who spoke with AppleInsider said that many of these companies are expanding their U.S. production in part because of orders received from "a large personal electronics manufacturer" that continues to see record breaking sales. Afraid to identify Apple by name, some in the industry are said to jokingly refer to growing orders from a mysterious "fruit vendor." One Apple supplier, Avago Technologies, is currently expanding its manufacturing processes in Fort Collins, Colo., and is planning to buy as much as $130 million worth of manufacturing equipment. Avago is responsible for making a custom part for Apple's iPhone 4S that allows one handset model to connect to multiple forms of wireless networks around the world, according to IHS iSuppli. AppleInsider inquired with Avago about its U.S.-based chip fabrication, as well as its assumed partnership with Apple, but the company declined to comment. Texas Instruments, another key Apple partner, is also currently ramping up production at its Texas chip fabrication factories. While the chipmaker is closing factories in Japan and Houston, one person familiar with the company's operations said those moves have come as the company turns its focus to products seeing increased demand. In particular, Texas Instruments is said to have seen orders grow considerably for its power management chips for mobile devices like smartphones. Texas Instruments already supplies a number of components to Apple, including the touchscreen controller in the iPhone 4S, as well as power management chips and a control device found in the new third-generation iPad. The company was also rumored in March to have begun manufacturing new power management chips for Apple's next iPhone. A person familiar with operations at Texas Instruments said its power control chip business, which is said to receive a significant number of orders from Apple, has generated "thousands of jobs" in the U.S. Many of those jobs are said to be high-paying technical jobs that require employees with engineering degrees, particularly at its Richardson, Tex., facility, known internally as "RFAB." The Texas Instruments fabrication facility in Richardson, Tex., opened in 2009. A spokesperson for Texas Instruments told AppleInsider their company doesn't comment on matters related to "potential customers," and declined to discuss the company's general chip fabrication business. Fairchild Semiconductor, which is believed to supply power supply chips for Apple's iOS devices, is also said to be producing over capacity at its American facilities. The San Jose-based company, which has been around in various forms since 1957, saw record quarterly sales for mobile products in the first quarter of 2012, and is in the process of adding more equipment in the U.S.
An individual familiar with Fairchild's business indicated to AppleInsider that the company's 200-millimeter wafer fabrication plant in South Portland, Maine, is currently at full capacity, as is its 150-millimeter facility in West Jordan, Utah. This person said Apple-ordered components built by Fairchild will primarily come from its Maine plant in the second half of 2012. Fairchild Semicondutor plant in South Portland, Maine, via Maine Ahead. AppleInsider reached out to representatives from Fairchild Semiconductor multiple times over the last week and a half, but the company failed to respond to any inquiries. There are also rumors in the industry that Maxim Integrated Products, a semiconductor manufacturer based in San Jose, has secured orders from Apple. The company has plants in San Antonio and Dallas, as well as Beaverton, Ore., and San Jose, Calif.
AppleInsider reached out to Maxim to comment on rumors that it has received orders from Apple, but the chipmaker declined to comment on that particular topic. However, Vivek Jain, senior vice president of Manufacturing Operations at Maxim, did discuss his company's general chip production business, and revealed that about 50 percent of its wafer fabrication production is based in the U.S.
Maxim recently began a multi-year investment in its American facilities, upgrading and expanding capacity at all of its U.S. fabrication plants. Jain said the investment will allow Maxim to improve product quality and upgrade its equipment while assimilating production from recently acquired companies. Maxim's 380,000-square-foot semiconductor fab in San Antonio was purchased from Philips Semiconductors Inc. in 2003. Jain said the companies Maxim partners with have not specifically asked the chipmaker to build more products in the U.S. But Maxim has focused on its American operations regardless, because the company feels it gives them a competitive advantage. "We have a very talented pool of resources in Silicon Valley and across (the) U.S. to develop new process technologies and do cost effective manufacturing, while protecting critical intellectual property," Jain said. Maxim Integrated Products is spending $65 million to expand its chip fab facility in San Antonio, Tex. 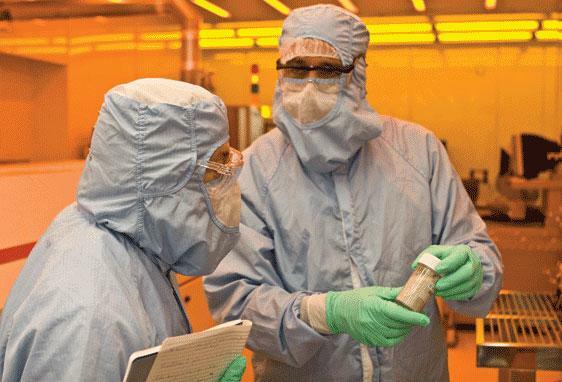 Maxim has 9,300 employees worldwide, and about 1,000 of those are manufacturing cleanroom workers at its four U.S. fabs, which produce integrated circuits for smartphones, tablets and more. Combined, Maxim's plants in San Antonio and Beaverton employ nearly 1,100 manufacturing and engineering staff. 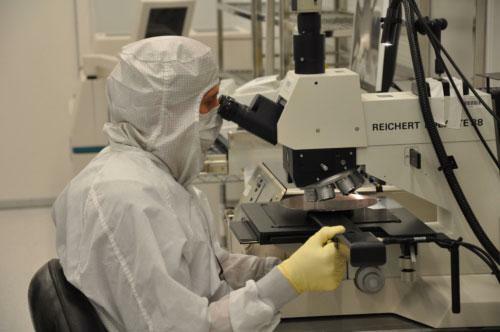 Even more high-end workers are expected to be added as the company continues its $200 million in upgrades aimed at expanding its U.S. semiconductor manufacturing facilities. It's impossible to tell exactly how much of Apple's products are truly built in the U.S. As evidence of this, Andrew Rassweiler, senior principal analyst at research firm IHS iSuppli, put together a breakdown of components found in the iPhone 4S, and 52.6 percent of the parts were considered "unknown." 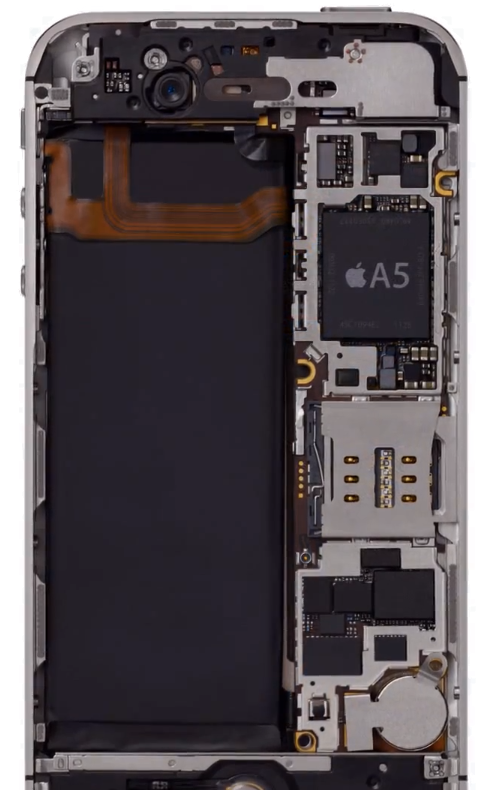 iSuppli's research did find that Samsung Semiconductor, which builds Apple's custom ARM processors in Texas, plays the biggest role in the iPhone 4S. They estimate that Samsung's components represent 12.4 percent of the smartphone's identifiable bill of materials. 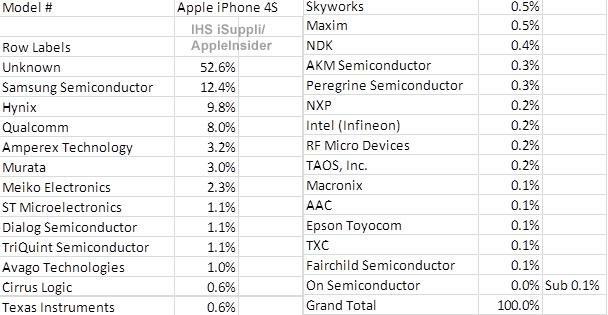 Avago Technologies is estimated to account for 1 percent of the bill of materials in the iPhone 4S, while Texas Instruments is pegged at 0.6 percent, Maxim is estimated to account for 0.5 percent, and Fairchild Semiconductor has 0.1 percent. Corning's Gorilla Glass, which serves as the scratch-resistant surface for the iPhone 4S touchscreen and is publicly acknowledged to be made in America, is estimated by iSuppli to represent another 0.6 percent of the smartphone's total bill of materials. Cirrus Logic, from Austin, Tex., is estimated by iSuppli to take 0.6 percent. RF Micro Devices accounts for an estimated 0.2 percent of the iPhone cost, and is based out of Greensboro, N.C. While a number of parts found in the iPhone, iPad and other Apple products come from American companies and are made in the U.S., those parts are still shipped to China where Apple's assembly partner, Foxconn, puts together the final product. Cook noted at D10 that much of the media scrutiny regarding Apple's overseas partnerships comes from an "intense focus on the final assembly." "Could that (assembly) be done in the U.S.? I sure hope so," Cook said. "But look, how many tool-and-die makers do you know in America? I could ask them, nationwide, to come here tonight and we couldn't fill this room." It's also worthwhile to consider that assembly jobs with companies like Foxconn tend to be low paying positions, which is in part why so many Chinese workers take on large amounts of overtime for extra pay. In contrast, the engineering jobs required for chip fabrication at companies like TI, Avago, Fairchild and Maxim are highly skilled, more desirable positions. "We do as many of these things [in America] as we can do," Cook said at D10. "And you can bet that we'll use the whole of our influence to do this."